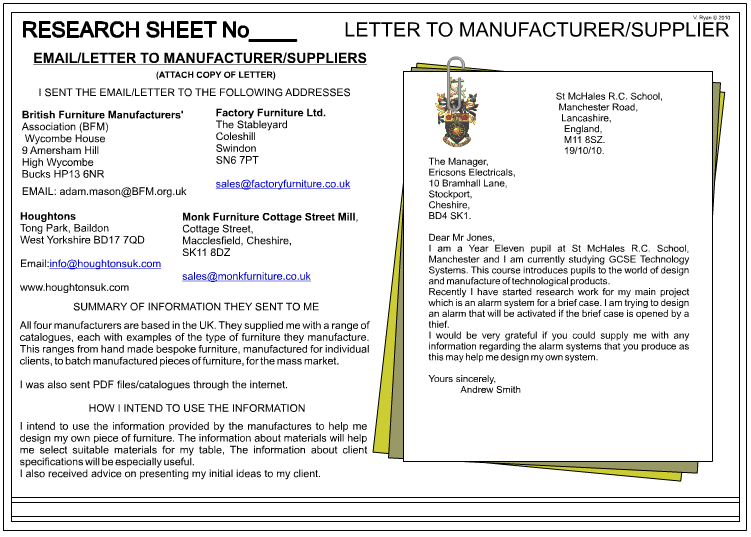 Writing a letter to a manufacturer or supplier is vital if you are to collect individual research work for your project. 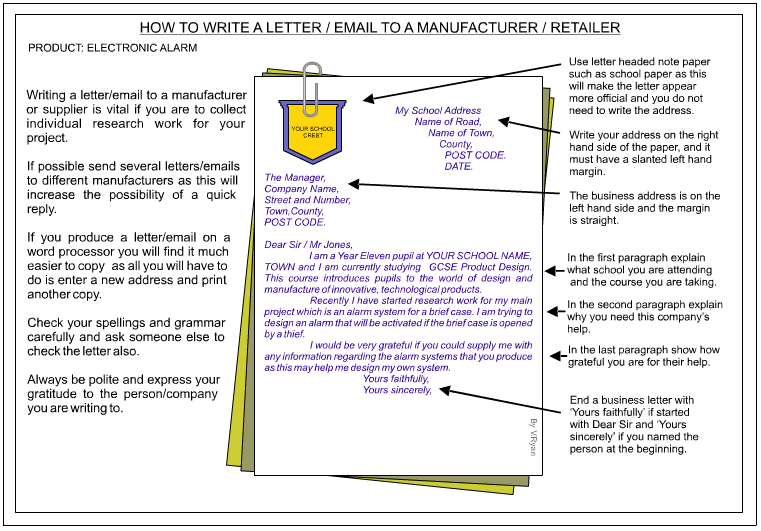 If possible send several letters to different manufacturers as this will increase the possibility of a quick reply. If you produce a letter on a word processor you will find it much easier to copy as all you will have to do is enter a new address and print another copy. Check your spellings and grammar carefully and ask someone else to check the letter also. Always be polite and express your gratitude to the person/company you are writing to. I am a Year Eleven pupil at St McHales R.C. School, Manchester and I am currently studying GCSE Technology Systems. This course introduces pupils to the world of design and manufacture of technological products. Recently I have started research work for my main project which is an alarm system for a brief case. I am trying to design an alarm that will be activated if the brief case is opened by a thief. I would be very grateful if you could supply me with any information regarding the alarm systems that you produce as this may help me design my own system. 1. Use letter headed note paper such as school paper as this will make the letter appear more official and you do not need to write the address. 2. Write your address on the right hand side of the paper, and it must have a slanted left hand margin. The business address is on the left hand side and the margin is straight. 3. In the first paragraph explain what school you are attending and the course you are taking. 4. In the second paragraph explain why you need this company’s help. 5. In the last paragraph show how grateful you are for their help. 6. End a business letter with 'Yours faithfully' if started with 'Dear Sir' and 'Yours sincerely' if you named the person at the beginning. Writing a letter to a business or manufacturer is one way of showing that you have carried out ‘primary’ research. Alternatively an email can be sent although this is less personal than a letter. The aim of sending a letter to a company is to enlist their help in collecting research. A good company / business will welcome interest from pupils / students in the products they sell or the skills they have. It may be necessary to send several letters / Emails to a variety of companies / businesses before you get a reply. The letter shown below was sent by a Technology pupil to an organisation that promotes pedestrian safety. 1. The letter should always be pleasant and polite. If the letter is not written in this manner it is unlikely that it will get a reply. 2. Word process the letter and then it can be printed out a number of times and sent to a variety of addresses. Always remember to alter the letter to include the company name and details. 3. If you know the name of a person in the personnel department of the company, consider sending the letter to them. A letter addressed to an individual at the company may result in a quick reply. 4. Do not write a long letter. Be precise, to the point, polite and grateful. A short letter is more likely to be read carefully by busy business people. There is no need for a long letter. 5. Look carefully at the structure of the sample letter. The first paragraph describes the person sending the letter and the subject being studied. The second paragraph explains in a simple way, the nature of the project being attempted. The third paragraph explains how helpful information from the business would be and that you would be grateful for any help given. 6. A letter that starts ‘Dear Sir / Madam’ should always end with ‘Yours faithfully’. A letter that starts ‘ with the persons name should end with ‘Yours sincerely’. 7. Get someone to check your letter for punctuality and spellings. 8. On the research sheet list the address to which the letters have been sent and describe how you intend to use any information received. A. Collect a range of useful company / business addresses including Email addresses. B. Rough out a letter and have it checked by your teacher. C. Word process the letter using the correct layout for an official letter. D. If you are sending the same letter to a number of companies/businesses, ensure that you change the company name and details on each one. Do not send a letter with the wrong company name on the top. You will probably not receive a reply. Write a letter to a supplier or manufacturer asking for help in collecting research for your project. Follow the example letter, seen above, if this is helpful.